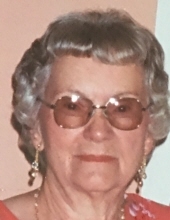 Doris E. Kerkman, 98, of Hayward, Wisconsin, passed away peacefully with family on Wednesday, January 30, 2019 at Hayward Area Memorial Hospital. Doris was born in Lawler, Minnesota on May 21, 1920; she was the daughter of Walter and Esther (nee Johnson) Gores. She spent her early life in Burlington, where she graduated from Burlington High School in 1938. On April 8, 1942 in DeRidder, Louisiana, she was united in marriage to Bernard A. Kerkman. Following marriage, they made their home in Waukegan, Illinois. Bernard passed away on November 23, 1980. Doris retired from North Gas Company after 30 years of service as a statistical clerk. Doris then moved to Sun City West, Arizona as a full-time resident. Doris relocated to Hayward, WI in 2017. Doris loved to dance, and became a member of the Hillcrest Dance Club. Doris also enjoyed traveling and went on a round the world trip with her sister Marian; numerous cruises, along with visiting Europe, Las Vegas, Alaska, Hawaii, and summer vacations at Lakewood’s Resort in Cable, WI with family, and visiting family in Hayward, WI. Doris is survived by her daughter, Diane Fischer of Hayward, WI; grandson, Kevin (Jennifer) Fischer and great-grandsons Thomas and Benjamin Fischer also of Hayward, WI; siblings, Lois McDonald of Burlington, Arlene Giedt of Hot Springs Village, Arkansas, and Albert (Janet) Gores of Burlington and numerous nieces and nephews. She was preceded in death by her parents, husband, son-in-law John A. Fischer; siblings, Robert Gores, Martin Gores, Marian Sarow and Mildred Morgan; and nephews, James Welch and Robert Gores. In lieu of flowers, please donate to Shriners Healthcare for Twin Cities, 2025 East River Parkway, Minneapolis, MN 55414 or Never Say Never Foundation, 3965 NE 15th Court Road, Ocala, FL 33479. Services for Doris will be held Monday, February 4, 2019 at 6:00 PM at Schuette-Daniels Funeral Home with Reverend Robert Wang officiating. Relatives and friends may visit with the family before the service from 4:00 PM until 6:00 PM. A private burial will take place at All Saints Cemetery in Pleasant Prairie, Wisconsin. To send flowers or a remembrance gift to the family of Doris E. Kerkman, please visit our Tribute Store. "Email Address" would like to share the life celebration of Doris E. Kerkman. Click on the "link" to go to share a favorite memory or leave a condolence message for the family.